In the last five years, linked suspensions have exploded in popularity, and for good reason - they offer not only the best performance, but also the most flexibility. By custom designing a multi-link suspension you have the most control over how the suspension performs and also how you route nearby components such as brakes, steering, and exhaust. However, due to their placement and the rock smashing abuse they are often subjected to, they can be quite vulnerable. Combine this with the critical job they have of controlling and positioning the axles, especially in high torque rigs, and there are few things more frustrating than bent and mangled links or destroyed bushings and joints on the trail. Many have experienced this frustration, and many have subsequently asked – what should I make my links from? This article will attempt to provide some insight into the answer. - Notching the tube and joining the links to the joints. At this point you might wonder if I’m not overdoing it just a bit. Could I not just say “Get some 2” x 3/8” DOM tube and weld on your favourite ends” and be done with it? Well, yes and no. Yes, that might work for some, but I know from experience it isn’t the best solution for many – depending on their needs. More importantly, many of the things I’ll discuss here can be applied equally to the design, selection or fabrication of any part – whether it be a simple suspension link or a full chassis – balancing cost, weight, looks, etc will always be required. Cost. The most obvious factor, but also one that can sneak up in unexpected ways. Obviously you want the most strength and reliability you can afford, but you have to be practical too. Titanium is wonderfully strong and light, but horrendously expensive, and a bear to machine and weld properly. You also need to be aware of possible future costs. 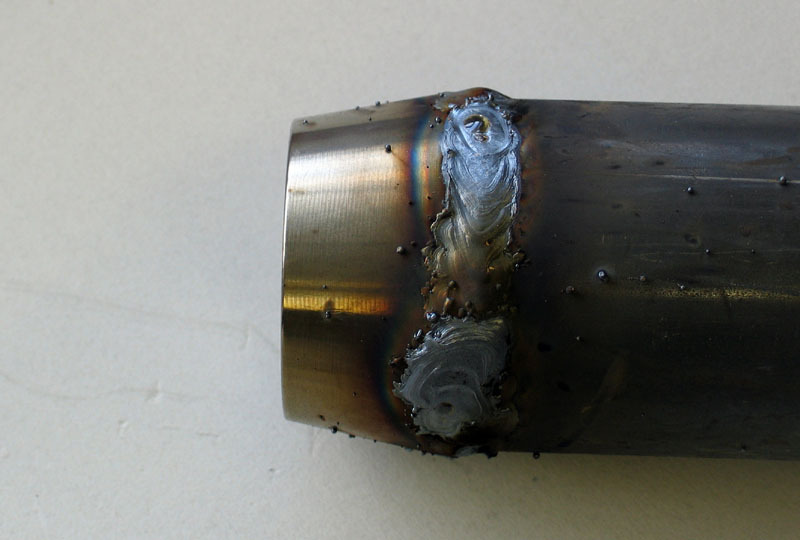 Sure, maybe with all the overtime this month I could afford chrom-moly links, and my buddy has the gear and know-how to weld them properly – but will I be able to afford to replace a broken part in the future, and will I still have access to the required TIG welding? Size. Strength almost always goes up with size – sure, you could use a 6” OD tube, and it would probably never bend, but how would you ever fit it? You have to take into consideration the practical limits of the size you can use. Weight. May or may not be terribly important to you. For competitors, weight is always a major factor, for others it may not be. Be aware though, that weight, and its placement, will affect the performance characteristics of all rigs. It can also add up a lot faster than you might think. Remember that weight is always a trade off versus strength. Ease of manufacture. By this I mean cutting, welding, bending, joining etc. This factor is strongly connected with size. 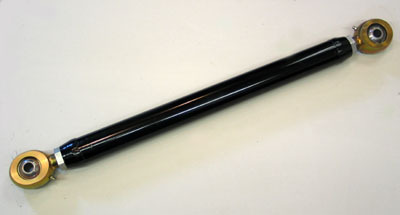 It’s probably no good buying ½” wall chrom-moly tube if your design calls for you to bend it in your manual tube bender. Likewise, even if you could source Titanium reasonably, it’s no good if you can’t cut or weld it. Consider carefully whether you have the tools, time and technical ability to turn your dream design into reality. Ease of repair / replacement. Is the material you choose likely to be available in the future if you need it or is it some one-off, unidentifiable tube you found discarded behind the plant? If you’re using commercially produced joints for your links (as most will) – will they be available in the future? Can the be rebuilt and are parts available separately? Don’t forget that, no matter how strong, anything’s breakable – will you be able to repair your design in the field if required? Shape & Design. I will argue that, pound for pound, straight, round mechanical tubing is likely the best choice for most of us. It’s readily available in a wide variety of diameters and thicknesses to suit any need, is easily cut, notched, and welded with tools most of us already have or can easily justify acquiring (because tube is so prevalent and flexible on a custom rig, we will always have a need/use for tube-working tools), looks good, takes up little space, is smooth for sliding off and over rocks, and there are any number of adjustable or non-adjustable suspension joints available specifically for round tubing. That’s not to say that you cannot make perfectly good links from square or rectangular tubing – you can. However, I shall stick to round tubing for this article. I am also a believer in straight links. First, they are the simplest to design and fabricate. 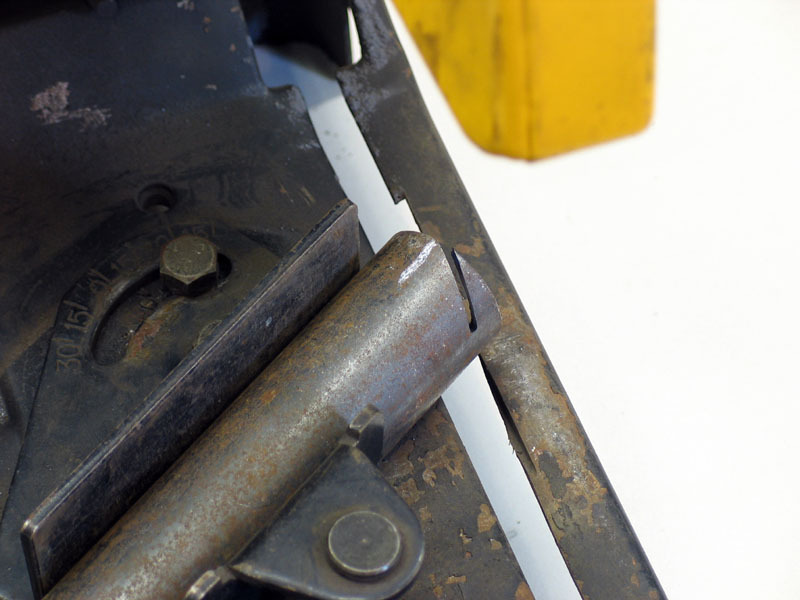 Second, any link bent for clearance or other design purposes will always require some sort of bracing to maintain its original strength – and very often this takes up most of the previously gained clearance. The result is very little clearance gained but additional weight and complexity added. Cleverly bent shapes have their place – but for most of us they are needlessly complicated to make or reproduce. Bend an already carefully bent shape in the field, and it can be almost impossible to get it back into shape - whereas a straight link can be pounded and levered back into something resembling straight much more easily. Of course, the most important design factor to consider is the goal – what we are trying to build and what do we want it to do? Suspension links will be loaded in a variety of ways – in compression and tension as they counteract the driveline torque, in torsion as they locate the axle during articulation, and in bending as they contact rocks and obstacles. It is this last case where the link’s strength is most critical. Rarely will a link fail in torsion or tension, but often we see links that are bent from the abuse of hard driving over rough terrain. So what we ultimately want is a link that will resist bending as much as possible. The following list outlines the six things we have to decide in constructing our links, and is followed by some technical proof of the factors. Length. The length of the links will be pre-determined by axle placement and suspension design. We must, however, keep in mind that the longer the link is, the more susceptible to bending it will be. The longer the link is, the more of a “lever” there will be to bend the link when there is contact between the link and an object somewhere along the link’s length. Being aware of this, we can compensate for very long lengths by compromising in other areas (e.g. 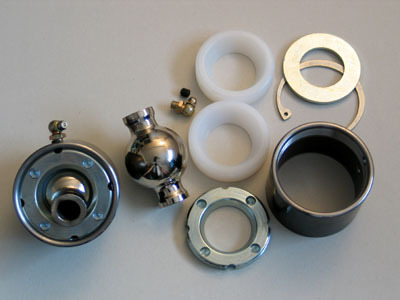 cost and weight) and using a larger or thicker tube than might otherwise be required for a shorter link. Size (outside diameter). The OD of the tube is the single biggest factor determining its strength. No other factor will have as great an effect on our link’s ability to resist bending. If you want the strongest links possible, the bottom line for tube size is pretty much "as big as you can fit”. Wall thickness. 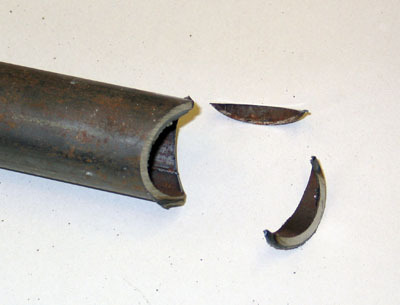 The thickness of the tube has the second largest effect on the links resistance to bending. However, since the biggest factor, OD, will likely be predetermined by the available space for the links, the thickness will likely be the factor we have to most carefully consider. Material. The material from which we choose to make our links follows closely behind thickness in terms of determining the strength of our links. Steel is the obvious choice for it’s combination of strength, stiffness, rigidity, elasticity, weight, ease of fabrication, and cost. There are four common types of steel to choose from: ASTM A-53 (or similar) pipe, electric resistance welded (ERW) tube, drawn over mandrel (DOM) tube, and chrom-moly DOM tube. The choice of material has a significant effect on the properties of the link – especially when you consider that yield strengths range from 30,000 psi for ASTM A-53 pipe to 90,000 psi for cr-mo tube. However, this difference is not as pronounced as you may think, and changing materials often doesn’t have nearly the same effect as changing the OD or thickness of the tube. For example, increasing a 1020 DOM tube link from 2” OD to 2.5” OD will have a much greater effect than staying at 2” OD and just changing to 4340 chrom-moly. End termination (type of joint) – The overall strength of the links, as well as its resistance to binding during articulation depends a great deal on the type of joints used at the ends. 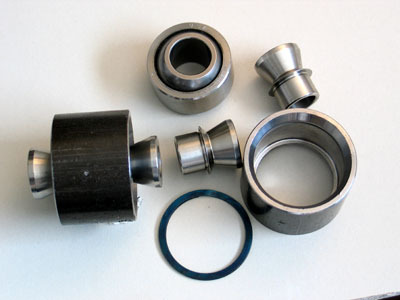 Fortunately there are many good choices available on the market today – gone are the days when I made my first adjustable links with little choice but to cannibalize old tractor top-links. Along with strength and deflection capability there are many other factors to consider in joint selection, including price, durability, availability, adjustability, and whether they can be greased and/or rebuilt. Our tolerance of part failure – The most personal and difficult to quantify of all factors, it is arguably the most important to consider in the design stage. Some folks enjoy the build-break-re-build cycle while others dislike/despise the results of broken parts, including loss of time, frustration, lost competitive opportunities, and ruined wheeling trips. Whether you are happily R&Ding the most cutting edge, finely tuned solution you can or are replacing a bent link for the 3rd time (and just wanting the damn thing to last) will have a big effect on your decisions. Fortunately for us, we don’t have to make detailed engineering calculations in order to design a material and have it produced for us. There are already a wealth of good choices readily available, along with a great deal of first-hand information from folks who have used different products. With a suppliers catalogue, this article, and a little bit of head scratching you should be able to come up with the ideal combination for your project. Table 2 shows the dimensions and specs of commonly available round mechanical tubing in a range of sizes most likely to be appropriate for suspension link construction. Note particularly the weight per foot column. Also be advised that, though prices aren’t shown, they tend to increase exponentially as the size and weight of the tube does. In order to make an informed decision about what tube we want to use to construct our links, it is helpful to explore in a little more detail the effect of tube OD and wall thickness on the relative strength of different types of tube. In order to do this we must consider two separate but related concepts – how much stress a tube will endure for a given load, and what the tube’s reaction to that stress will be. The stress is related to the cross section (shape) and size of the link. The reaction is related to the material the link is made from. The model doesn’t take into account multiple loads, dynamic loads, shock loads, tapering cross sections (as in the case of threaded adjustable links), or loads applied at locations other than the center. Y = the distance from the neutral axis (longitudinal center of the tube) to the extreme outside fibre – in other words, the radius of the tube. Because the formula for (I) takes into account both OD and ID of the tube, it is the same thing as taking into account the OD and wall thickness, the two specs we use for purchasing – i.e. the inside diameter is equal to the OD minus two times the wall thickness. A tube’s moment of inertia really describes how easily something bends by quantifying how much material there is and how far from neutral axis (the line about which the bending occurs) it is located. Common experience confirms the truth of the equation. You could quite easily take a 3 foot long ¼ “ solid bar and bend it by hand. However, if you were to place the ¼” of steel much further from the neutral axis by having a 4” pipe with 1/8” thick walls, it would be impossible to bend by hand. So, with the OD and wall thickness we can calculate the moment of inertia and section modulus for any tube. Calculated values for common tube have been included in Table 2. If we then take our model with and assume a 48” link and a theoretical load of 5000 lbs, we can calculate the maximum stress at the center of the tube under that load. Table 2 also includes these calculations. By comparing the results of these stress calculations we can get a good idea of the relative strength (in terms of resistance to bending) of different sized tubes. To make the comparison even more clear, I chose, (completely arbitrarily) to assign a value of 1 to the stress (calculated using our model) in a 1.75” x ¼” wall tube. I then calculated the percentage difference between the stress in any other tube compared to this base value. The results appear in the last column of Table 2, with a (-) indicating that the tube is x% “weaker” than 1.75 x 0.25 tube, and a positive number indicating that that tube is x% stronger. To compare two tubes directly, take the higher stress value from the table, subtract the lower, divide the result by the higher and multiply by 100. Therefore, at 8.0 lbs / ft, the ½” wall tube is 19% heavier than the 3/8” wall tube (6.5 lbs / ft) but only approximately 10% stronger. Now, you might reasonably ask, how do you account for the different material different tubes are made from? Recall that the second factor we must consider in our link’s strength is its reaction to stress. That is, when choosing a tube based on OD and wall thickness, you can see that the stronger the tube, the less stress it experiences for a given load – but what does this translate to in the real world? E = Modulus of elasticity of the material. The modulus of elasticity is a measure of stiffness, and is a constant value for all steels (approximately 30,000,000 psi). This equation illustrates that how much the tube will bend under load is still only related to the OD and wall thickness, not the material, since the equation includes (I) and (E) but no variable that accounts for differences in material. What this means is, all steels are comparably stiff, they will all resist bending about the same amount - from cheap pipe to expensive cr-mo tubing. The difference between them is what happens when they bend. The better, more expensive steels, due to their much higher yield points and greater elastic ranges (Table 2), will be able to easily shrug off the load, returning to shape. The lesser materials may yield (take a permanent set, or bend) or actually rupture. The key to the difference between different steels is the relationship between the stress and the yield strength of the material. When stress is greater than yield strength, the link will yield or permanently change shape, if stress is less than yield strength, the link will simply return to shape after the load is removed. Table 2 shows a list of common materials used in link and other 4x4 related construction. Note the very different yield strengths of the different steels. Don’t be tempted to directly compare the stress numbers in Table 2 to the Yield Strengths in Table 1, because the numbers in Table 2 are purely arbitrary, for purposes of comparison only, and not representative of any real-world scenario. For example, don’t be tempted to look at Table 2 and note that the stress example for a 5000 lb load is only about 15,000 psi, and then look at Table 1 and calculate that this 15,000 psi is only half the yield strength of pipe and conclude that 1-1/2” x 1/8” pipe will be strong enough, as this would be a mistake. Actual calculations of real-world dynamic loads are for more complicated than I have shown here, and it is likely that in service your links will see stresses tens, possibly hundreds of times greater than those shown in Table 2. The equations and values shown here are simply for the purpose of understanding and illustrating the concepts discussed; they are not to be used for calculations, and do not include critical elements such as design factor, impact loads, safety margins, and fatigue factors! - The larger the OD and the thicker the wall of the tubing you choose, the less stressed the tube will be for any given load. 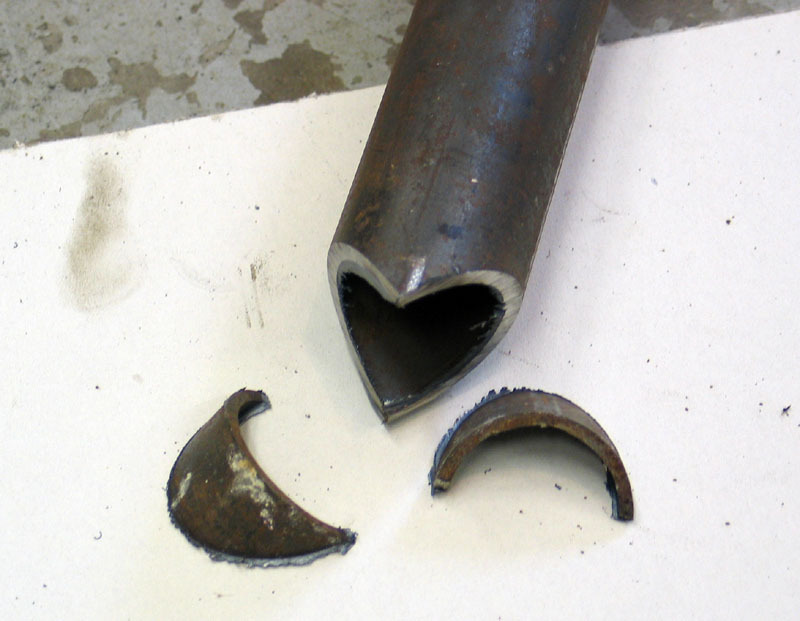 - The higher the grade of steel you use, the less likely any given stress will be to exceed the tube’s yield strength and cause a permanent bend or break. * Average representative values only – actually values vary greatly and depend on the condition of the product. For example, 4340 chrom-moly steel can have a yield strength ranging from 68,000 PSI (annealed at 1490*F) to 243,000 PSI (quenched and tempered at 400* F). Consult exact product specification from product supplier for accurate figures. One last consideration that relates primarily to material type and wall thickness is the property of impact resistance. By this I mean the link’s ability to resist small localized denting, scrapes, and nicks. Very difficult to quantify for direct numerical comparison, nonetheless we can state that the thicker the wall and the higher the quality of the steel the “tougher” the tube will be and the better it will be able to resist damage. Table 2 gives the dimensions and approximate weight for a wide variety of tubes that are available in ERW, DOM, and Cr-Mo, one of which should meet your needs. Check with your supplier for availability of a particular size and type. * Calculated as the stress developed in a 48” long beam, supported at both ends and evenly loaded in the center. ** Percent difference between the stress in this tube and the stress in an arbitrary standard tube of 1.75” x ¼”. 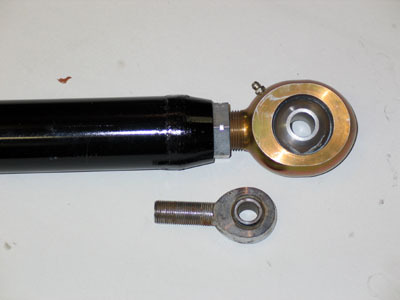 The selection of the joint for the suspension link is at least as important as selection of the tube. Having destroyed countless rubber and poly bushings I am a firm believer in using some sort of cartridge-style joint or spherical rod end (Heim joint). There are many good choices available on the market, all with their advantages and disadvantages. 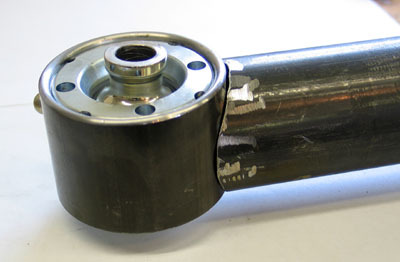 Cost – the cost of expensive joints can add up quickly, especially since a standard 4-link front and rear suspension uses 16 joints. 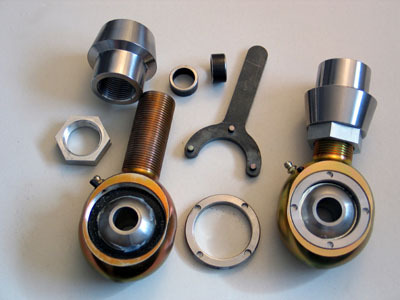 Lubrication – The “sealed vs greaseable” debate is timeless and boils down to personal choice. Depending on the conditions of use and your preference, you may wish to use joints that can be periodically lubricated. 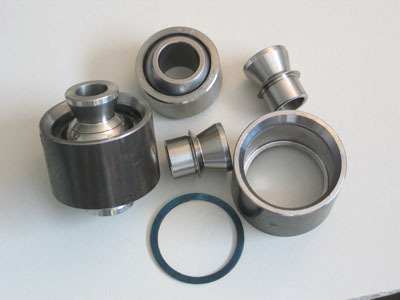 Some joints are “self lubricating” meaning they use some sort of chemical-impregnated cup or liner that lubricates the bearing but will eventually wear away – make sure these are rebuildable. For a detailed article on joint selection see my article "A Joint for Any Occasion"
As previously mentioned, I am a fan of the simple straight link. However, you may prefer to more highly customize your links. 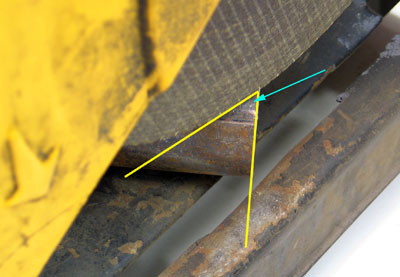 Two common approaches are 1) offset mounting to the joint and 2) links that are pre-bent or curved for clearance. If you decide to design links with such features, there are a couple of "gotchas" to watch out for. If you decide to gain extra clearance by joining the link more towards the top of the joint than to the center, be aware that you will have to adjust the notch in your tube accordingly and that you may further reduce the maximum size of the tube you can use. Of course, if you use a threaded, adjustable joint this will not be an option. I am not a fan of “bent links” because the design either requires bracing which then eats up any previously gained clearance, or leaves the link significantly weaker than if it were not bent. A curved link shifts the neutral axis from the gravity axis (straight line between the ends of the link) toward the center of curvature (the concave side of the link). This shift in the position of the neutral axis causes an increase in the stress on the concave side of the link - up to as much as 3.5 times the stress in a straight link. What does this means in real-world terms? It means, depending on how curved the link is, a bent-link design may require a massive 2-3/4 x ½” tube, weighing over 12 lbs/ft to equal the strength of a 1-3/4 x ¼” straight link that would weigh only 4 lbs/ft. In other words – three times the weight and almost twice the diameter! The simplest kind of link to build is one that uses, at both ends, joints with threaded shanks and slip-in threaded tube adapters. In this case, you only need to cut the tube to length, insert and weld in the threaded adapters, screw in the joints and you’re finished. 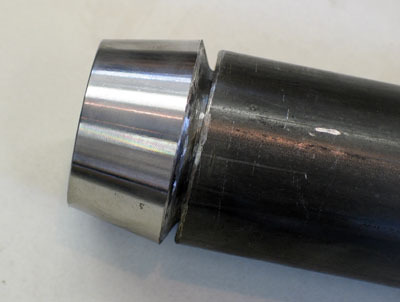 When measuring the tube, you will, of course, have to account for the length of the tube adapter, shank of the joint, and distance from shank to bolt hole. When doing so, do not make the mistake of counting the entire length of the threaded shank. I will normally measure the length of the threaded shank, then subtract the length of the threads not available for adjustment. This is equal to the length of the minimum number of engaged threads (calculated as the length of the adapters internal threads plus 3-4 threads) and the length of the threads taken by the jam nut. The resulting number is the length of threads available for adjustment, which I then divide by two, using the resulting figure for the calculation of link length – this allows me to essentially install the link in the middle of its adjustable range so that I can later make it shorter or longer as required. 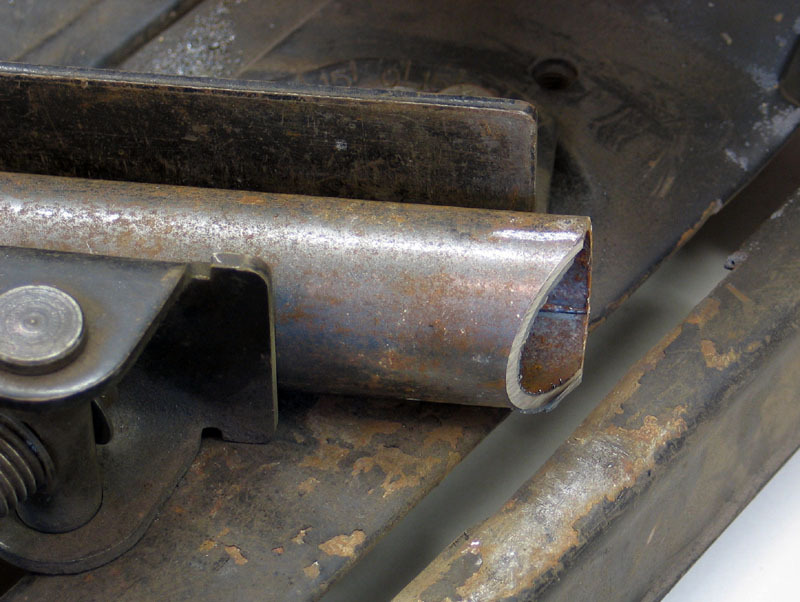 At the other end of the scale is a fixed link with both joints welded directly to the tube. This approach has the advantage of strength and simplicity, but requires extremely careful and accurate measurement and triple-checking as there is no ability to adjust the lengths after construction. Mismatched or inaccurate link lengths will effect steering geometry, suspension performance, and pinion angles – so great care is required. The other tricky part of making a fixed link with joints welded to both ends is that you have to get both joints at exactly 90* to the tube, and both in the same plane. If not, you will either eat up precious misalignment just to install the link, or worse, not be able to install it at all. Figure 1 illustrates the method I used to mark the tube centerline for my fixed-length, lower, front links. 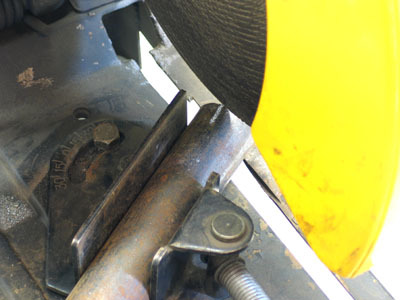 First, clamp the tube in a vice and use a level to make sure it is vertical both side-to-side and front-to-back. Next, use a carpenter’s chalk line to mark a plumb centerline on the tube. Using this centerline as a reference point should allow you to notch the tube so that both joints will be square to the tube and in the same plane. Notching the tube is the final challenge before welding up the links. There are three basic methods for notching tube: tube notcher, chop-saw, and template. Using a tube notcher is the most obvious method – providing you have one. The only caution is that many notcher’s may have a difficult time getting through two inch diameter, half-inch wall tubing. If you use a hole-saw type notcher, be particularly careful of it catching in the cut and trying to break your wrists. 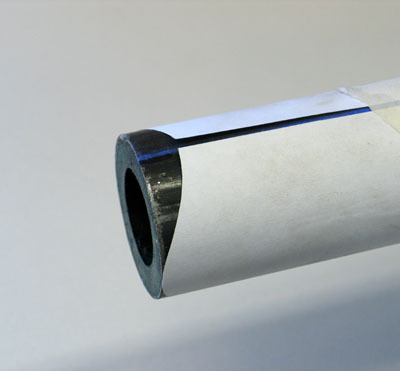 With a little patience and practice, you can cut excellent notches in tube using a chop saw. The first step is to mark the centerline of the tube in 2 places exactly 180* apart. Next, set the required angle on your chop saw and chuck the tube in the saw with the blade just touching the first centerline mark (Fig 2). Make the cut (fig 3), and the tube should then look like fig 4. Next, rotate the tube in the saw 180* until the blade just touches the opposite centerline mark (fig 5). 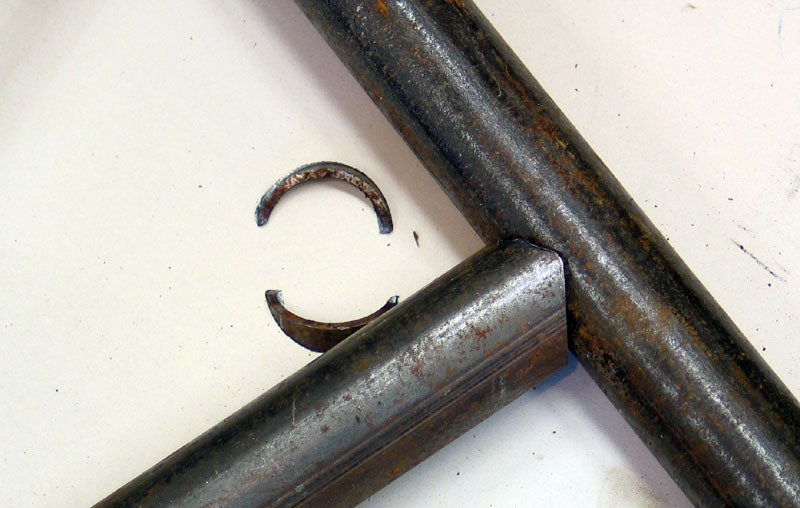 Make the final cut, and you will be left with 2 small slivers of tube and a well-formed notch for joining to another tube (fig 6 & fig 8). To make quality, accurate cuts you need to use a decent chop saw with a fairly rigid base and vice, and to use a quality abrasive cutting wheel designed for cutting tube. I prefer Walter brand cutting wheels as they are good quality, last well, and indicate on them with a little icon whether they are suited to cutting tube. The key to success with this method is how accurately you calculate and make the two cuts. Figure 9 illustrates the angle you are setting, and Table 3 gives some values for the cut angle for various sizes of tube. Generally, the larger the angle, the deeper and more narrow the notch. Figure 6 shows a notch cut at 30* and figure 7 shows a notch cut at 45*. Because all chop saws will vary a little and even the best are only capable of limited accuracy in angles the best results will be obtained from using the values in the table as a starting point and then proceeding to practice with your actual tube, keeping a 4.5” angle grinder handy to clean up the notches. After the initial cuts, test-fit the tubes and make any required touch-ups to the notch with the grinder (fig 8). Note that the values in Table 3 are for joining two tubes at 90* to one another. If you want to join the two tubes at an angle (either to offset the link from the joint, or more likely in other tube work such as roll-cage building) you must adjust your cuts as follows. Take the angle at which you want to joint the two tubes, and then modify the initial cut angles by adding this value to one, and subtracting it from the other. For example, if I wanted to join a 2” tube to a 2” tube, the initial cut angle is 30*. If I wanted to join the tubes at a 15* angle, I would add 15* to one cut and subtract it from the other. In this way I would make one cut at 45* and the other at 15*. The values in the table were calculated and kindly provided to me by Marc "Tigweld" Googer. Marc notes that the figures given are for .120" wall tubing and that wall thickness can dramatically affect fit. Thicker walled tube will require either an adjustemnt to the figures shown or some post-cut cleanup with the angle grinder. 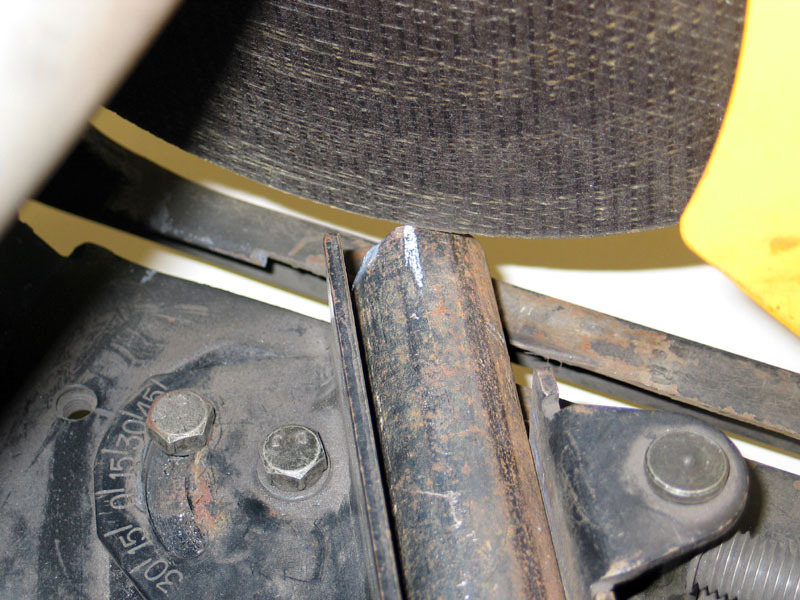 The only limitation to the chop saw method of tube notching is the angle-capacity of the chop saw – most do not cut angles greater than 45*. NEVER ever be tempted to bypass the chop saw’s vice and simply hold the tube at a steep angle – no matter how strong you think you are there is a very good chance the blade will bind in the cut, rip the tube from your hands, possibly taking finger tips with it, and fling it across the shop with frightening force - as usual - ask me how I know this!. If in doubt about the angle to use, it is best to cut a little shallow (smaller angle) and finish the notch with a hand-held angle grinder. The third method for notching a tube is to use a computer program that will allow you to enter the tube dimensions and will then calculate and print a template for your notch. You can then cut out this template, trace it onto the tube, and use any of several methods to cut along the lines of the notch (chop saw, 4.5” angle grinder with cutting disc, plasma cutter, etc.) Depending on how rough your cutting was, you can then clean up the notch with a 4.5” angle grinder to get a perfect fit. One such program available on the internet is Winmiter. It is a shareware program originally written for bicycle building enthusiasts. It accepts inputs of: large tube diameter, small tube diameter, angle of joint, and centerline offset, in metric or imperial units. It will then compute and display and/or print a simple template. I used this method for notching the 2” x 3/8” tube for my front lower links and it worked fairly well. Fig 10 shows the template cut out and taped to the tube, ready to be traced. After cutting the notch with a plasma cutter I then used a grinder to clean it up, pausing periodically to check the fit (fig 11). The final step in joining your links to non-thread-in joints is to weld. The Evolution tube inserts come with a generous bevel (fig 12) allowing for a good strong weld (fig 13). If welding a tube directly to the body of a joint, make sure you have a good, clean, tight fit. Fig 11 shows a 2” tube being test fit to a RE joint and reveals that a little more grinder work is required on the tube to get the best fit. Patience is the key as a tight fitting assembly will ensure a strong weld and ultimately strong links. Figures 14, 15, and 16 offer a final look at some of my completed links, built using the products and procedures described in this article. May you experience the greatest success in your own projects. Good luck! 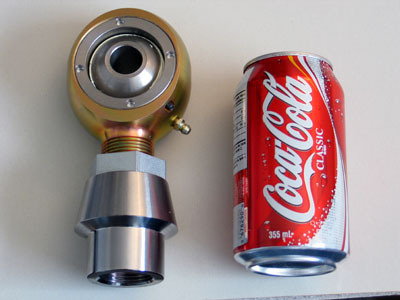 to standard ¾” Heim joint for scale. The four digit number you often see quoted in reference to a particular type of steel (e.g. 1020 DOM) is a standard four digit numbering system developed by the American Iron and Steel Institute (AISI) in cooperation between with Society of Automotive Engineers (SAE). The first two digits of the designation are the "classification" of the steel. Mild (carbon) steels all belong to one of four classifications, only two of which are of interest to us - the 10xx and the 15xx. For both mild and alloy steels, the last two digits of the standard four digit designator indicate the approximate carbon content of the steel in tenths of a percent. For example, SAE 1020 contains approximately 0.20% carbon. The higher the carbon content the higher the ultimate tensile strength of the steel — and the lower the ductility. The four-digit designator not only helps us to precisely identify the steel in question (so that we can buy and use the right stuff), but also tells us quite a bit about it at a glance. For example, I know that 4340 is a steel alloyed with Nickel, Chromium and Molybdenum; and that it has a carbon content of approximately 0.40%. What is an “Alloy Steel”? Alloy steels are steels that have had finite and precise amounts of alloying elements added to them during their manufacture. Alloying Elements are chemical elements added for improving the properties of the finished materials, such as nickel, chromium, and molybdenum. Small, precise changes in the exact chemistry of a steel can change its mechanical properties quite drastically. Generally, alloying elements are added to steel to maximize some particular mechanical property(ies). Of course, nothing in life is free, and there is always a price to pay. The more alloyed a steel is, the narrower it's appropriate use, as it becomes more and more specialized (narrow in focus). There is also a trade off in the reduction of other properties: as hardness and strength go up due to alloying with chromium and molybdenum - ease of welding and ductility go down, and of course cost goes up - in some cases WAY up. Note that the hugely popular designation "Chrom-moly" is a reference to the fact that the steel in question has major alloying elements of Chromium and Molybdenum. 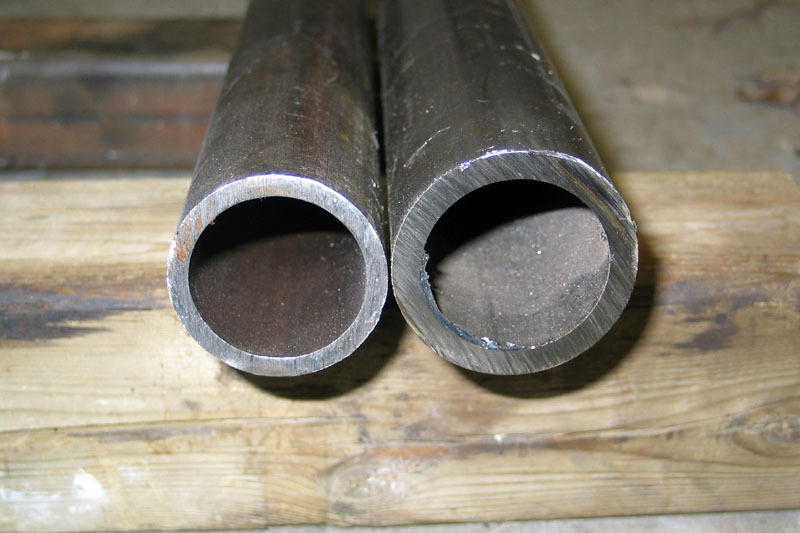 41xx and 43xx alloy steels can and frequently are both refereed to as "Chrom-Moly Steel", though obviously the 43xx also has significant Nickel added. When researching, designing, or discussing any fabrication project that uses steel, you may find the flowing definitions of the properties of various steels useful. Plastic Deformation - Deformation of a material that will remain permanent after removal of the load which caused it. Quenching & tempering - procedure consisting of heating the material to the proper temperature, holding at that temperature for a sufficient time to effect the desired change in crystalline structure, and quenching in a suitable medium - water, oil or air depending on the chemical composition. 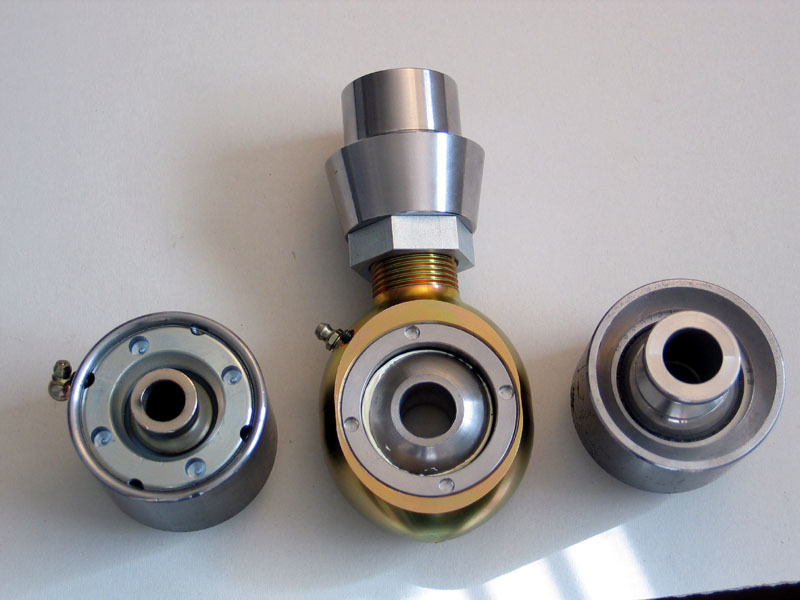 After quenching, the material is reheated to a predetermined temperature below the critical range and then cooled under suitable temperatures (tempering). 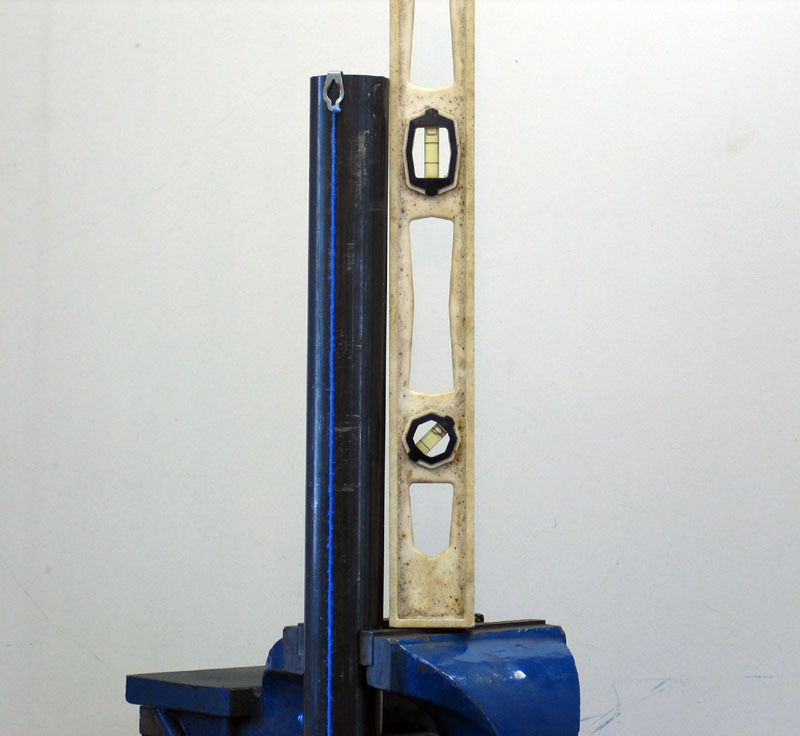 Stiffness – the ability to resist deformation under load. Strength - the ability to resist an external force or load, without deforming, breaking, or rupturing. Technically we say a material’s strength is the greatest stress it can endure without rupturing. There are many specific kinds of strength, from tensile, compressive, and shear to complicated combinations such as torsional and bending. Stress - a force or load applied, divided by how big the part is (i.e. force per unit of cross sectional area) measured in pounds per square inch, or PSI. Strain - a change in shape or dimension in response to a stress, usually expressed in percent elongation. Toughness – The ability of a metal to absorb energy and deform plastically before fracturing. It is usually measured by the energy absorbed in an impact test. Hardness – is the property of resisting penetration. Normally, the hardness of steel varies in direct proportion to its strength – the harder it is, the stronger it is, and vice-versa. Yield Strength - The point at which a material exhibits a strain increase without increase in stress. This is the load at which a material has exceeded its elastic limit and becomes permanently deformed. Stress corresponding to some fixed permanent deformation such as .1 or.2% offset from the modulus or elastic slope.